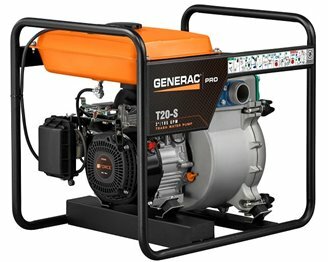 The Generac PRO Trash Pump is your water removal solution for construction, municipal and commercial clean-up jobs. It also works well for wastewater management on residential properties. You can rest assured the area will be clean after the pump does its job. This 2-in. trash pump operates at a rate of 185 gallons of water per minute. From a small water leak to a massive water emergency, this pump works. This pump has a durable design suitable for any environment. It features a silicon carbide seal, cast iron volute, and impeller. This trash pump features a durable, 1-in. frame, made for any environment. From basements to parking lots, ponds to farm fields, you can transport this unit without worrying about damage from rough terrain. 3 Gallon Fuel Tank- Lasts up to 5 hours. Key Touch Icons- With onboard instructions.